Have you been wondering what all the buzz is about when it comes to local food? Why should you buy something from a farm in your area and what is the big deal about locally-grown ingredients? 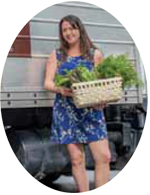 Did you know that every food purchase you make, whether it is from a grocery store, a farmers market, a restaurant, a fast food drive-through, a convenience store, a big box store or a local farm makes an impact on our environment and our local economy? That means that every time you eat something a portion of your investment goes to either a farmer, a manufacturer, a food processing plant or food packaging materials. Another portion of your investment goes to a vast amount of resources: fuel and man-hours to transport the food for up to 6000 miles. The middle men, taxes, chemicals and non-renewable fossil fuels used over and over again for this process have an effect on our environment and, ultimately, our health. Right here in Central Florida we have a blossoming local food system. This month I interviewed four farmers: Luc Duytsche, owner of A Natural Farm and Education Center; Richard Kann, owner of Heart of Christmas Farms; Jim Hunter, owner of South Seminole Farm and Nursery; Dale Volkert of Lake Meadow Naturals Farm, and local food distributor Emily Rankin, owner of Local Roots. Samadhi: What does local food mean to you? Luc: “Local food means food grown within 50 miles by small farms you can visit and trust.” There are numerous farms, markets and restaurants providing locally-sourced options with everything from lettuce, blueberries and tomatoes to eggs, milk and meat. S: Why is local food important? S: And less dependence on gasoline, a fossil fuel that will not be replenished. You are stimulating our Central Florida economy. Richard: “Local food means local jobs.” Restaurant chefs have been reaching out to farms for locally-grown items to include on their menus. Dale told me he kept getting larger and larger orders from a restaurant he started working with years ago, so he continued to add more and more chickens to his flock. Larger flock = more local jobs = more robust local economy = more local food. 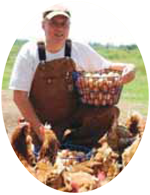 Transporting the eggs to the restaurants and, ultimately, the consumers is another type of employment opportunity driven by this cycle. The demand for local food has grown exponentially in the past several years leading to farm expansions, farmer’s markets and local food hubs. 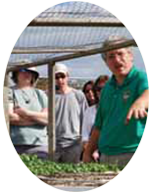 Each farm has its specialty items which change according to the seasons. However, Heart of Christmas has an unusual system called aquaponics. This water-based system allows some temperature and climate control of the growing environment, leading to a variety of foods being produced year round. Many foods that grow here in Central Florida are unique to this region. Large corporations, which grow foods for the mass food supply, will plant hundreds of acres of the same crop (“monocropping”). This goes against nature, depletes our soil and creates other imbalances in our ecosystem. These imbalances lead to pesticide-resistant bugs—requiring more and more chemicals. S: They are quite beautiful to see when you visit. Why is chemical-free farming important? 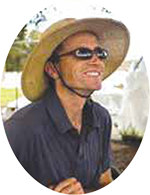 All the farmers I interviewed agree with Luc: “Chemical free farming is important to respect the soil, the aquifers and the people eating our food.” Chemical-free farming is more labor intensive than other methods. Jim: “I worked for a commercial nursery when I was younger and saw a lot of dangerous things happen because of chemicals. I vowed to never work with harsh chemicals and pesticides in the future.” He has kept that promise to himself and, thankfully we, as consumers, get to benefit from that promise. Local farms contribute positively to this cycle by growing a variety of crops without chemical sprays and without Genetically Modified Organisms (GMOs.) This allows for beneficial insects, bees and butterflies to flourish. Crop diversity helps our environment, our global ecosystem and our individual creativity in the kitchen. By supporting your local food system, you are eating the most flavorful ingredients with the highest nutrient density while you are reducing pollution and supporting your local economy. This was driven by the consumer demand for more white meat. Lake Meadow Naturals uses older heritage breeds that still taste like turkey and can mate naturally. Most farmers are up before the sun rises, work 10-12 hour days and dedicate their entire lives to their farm. In fact, I recently visited A Natural Farm and Education Center the day after Christmas where Luc and his son Julian were working in the fields together. Farming is a 365-day-per-year commitment. Local farms are about community, family and responsibility to our environment and our health. There are classes, farm tours and community projects involving children and adults at the farms mentioned here. There are hundreds of places to buy and eat locally-grown food. 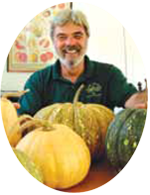 To find a local farm in your area, go to the Central Florida Local Food Guide on-line and see the list. Local farms foster a personal connection with the farmers, the food and the land. Join the local food movement, take a trip to a local farm, meet the farmer and deepen your appreciation and respect for the food you are eating. Richard: “We consider all farmers important. Without them we would have no real food supply.” Luc, Jim and Dale grew up farming. Richard started his farm because of his son’s school project and now his entire family participates. Luc’s whole family is involved with the farm. Growing food is an age-old tradition. Imagine growing up like Dale, having never tasted store-bought bread or eggs until he went away to college! Doesn’t it make more dollars and sense to go right to the heart of our local food system? When you choose locally- grown food you are keeping your investment right here in our local community, helping build a sustainable economy and food system that will continually provide for you and generations to come. Farm-Fresh is definitely the way to go!